This is an advanced book of sixteen chapters on one Sutra ranging from elementary multiplication etc. to the solution of non-linear partial differential equations. It deals with (i) calculation of common functions and their series expansions, and (ii) the solution of equations, starting with simultaneous equations and moving on to algebraic, transcendental and differential equations. 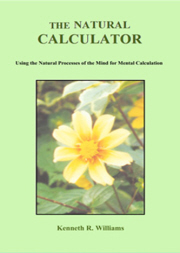 The text contains exercises and answers. Vedic Mathematics offers a fresh and highly efficient approach to mathematics covering a wide range- this book starts with elementary multiplication and concludes with a relatively advanced topic, the solution of non-linear partial differential equations. But the vedic scheme is not simply a collection of rapid methods: it is a system, a unified approach, which can be swiftly learnt. Although primarily intended for mental working, this approach has considerable potential for automatic computation. Good tools yield best results in the hands of skilled craftsmen. The computer is a powerful tool, and to be well-used it requires application of the best available relevant skills. What is the essence of the system? Bharati Krishna Tirthaji, who rediscovered it earlier this century, tells us it is based on sixteen sutras. A sutra is a terse statement of an important point or principle. Ultimately the essential nature of the approach is to be discovered by using it. Nevertheless, certain points can be made. In arithmetic, it uses positional notation. In particular, it uses the decimal system, which is regarded as using a pattern made of nine elements, the numbers 1 to 9, together with the zero, which acts as a spacing element. Something resembling the attitude in question is found in our use of telephone numbers, in which quantitative considerations are of the least importance, and the emphasis is on the pattern. Thus the number 243 is treated as a pattern of 2 followed by 4 followed by 3, a qualitative entity, rather than as the quantitative entity 'two hundred and forty three' (which would signify nothing to a telephone exchange). The fact that 'one' stands for a single unit, tens unit, one hundred, one thousand, etc. in the decimal system makes in a sense no difference to its 'quality' as the number one- it retains its oneness. The same of course is true of all the other elements up to nine in that system. Should the base be different from ten, this same fundamental fact applies to the elements needed for that base. In the vedic scheme, each number is also not simply considered in itself, but it is, in general, seen in relation to a base. Thus '8' brings to mind a deficiency of 2 from the base of 10, '7' that of 3 from the same base, etc. As some early examples in Chapter 1 show, this simple device can lighten the task enormously at times. Vedic Mathematics extensively exploits the properties of numbers in very practical applications, particularly in the field of computation. It makes available a whole range of methods ideally suited to these properties. Owing to the nature of the sutra, the book 'Vertically and Crosswise' is concerned mainly with general methods. But the vedic approach has also its special methods- indeed rather more of them than conventional mathematics. The situation is not unlike that of a skilled craftsman who has a whole array of tools to draw from and selects whatever is most suitable for the work in hand. This large flexibility of method finds itself reflected in the mind when approaching problems from the vedic viewpoint. As a doctor in biochemistry remarked during a presentation, 'My mind works this way'. This indeed is the great benefit of the approach, particularly when taught to younger students. Presented by a skilful teacher, its simplicity and ease readily shine forth, and one is left wondering at the reason, or lack of it, for most of our usual methods. By use of aphorisms (or 'sutras') easy to memorise, it is perfectly adapted to oral teaching and mental calculation. The only additional need is plenty of simple practice. 1) It is concerned with calculation, and the evaluation of functions. 2) It deals with the solution of equations, beginning with simultaneous linear equations, and moving on to algebraic, transcendental, and differential equations. These days there is considerable interest in the use of bases other than ten. That algebra is a generalisation of arithmetic is widely understood. What is not always appreciated is that the polynomial acts as a generalisation of positional notation, the base of 10 or 2 or whatever being replaced by a base of x, or some other letter. The student may be held back by various hindrances to this appreciation. One is simply overlooking that x0 = 1. Another is that digits recorded in positional notation are, by custom, all positive, whereas the constants of a polynomial can be positive or negative. The vedic scheme uses both positive and negative digits however, which deals with this point (see Chapter 1). A third difficulty is that, in positional notation, it is not customary to use digits exceeding the base- rather than this we carry figures into the next place. But this limitation is not essential. It is quite feasible to have numbers exceeding the base, in any given position, and the vedic plan allows for and makes use of this. Once the important connection between algebra and arithmetic is established, that a polynomial can be seen as a positional notation with the base unspecified, an important question follows: can we, in that case, have an efficient system of computation applicable to both arithmetic and algebra? That the vedic scheme makes provision for this is shown in this book. In consequence, on having learned arithmetic methods, very little extra is required to learn algebraic ones. This is something which a study of the 'vertically and crosswise' sutra demonstrates. The ramifications are considerable- to the extent that the very last chapter of this book rests essentially on methods expounded in Chapter 1. At this point the reader might welcome some historical background. The vedic tradition was originally oral. Memory was aided by versification, and by terse statements of important points, called 'sutras'. When the vedic period began is uncertain, but according to modern scholars the Vedas began to be written down about 1600 or 1700 BC. There are four of them: Rig-, Sama-, Yajur-, and Atharvaveda. In the course of time, no doubt influenced by the numerous invasions of India, much of the vedic tradition fell into disuse. Then in the 19th century scholars took renewed interest in the Vedas. It is recounted in the author's preface to 'Vedic Mathematics' how they could make no sense of the mathematical portion of the Vedas (an appendix to the Atharvaveda). Then Shri Bharati Krishna Tirthaji, after lengthy and careful investigation, produced a reconstruction of the ancient mathematical system based on sixteen sutras, together with a number of sub-sutras. He wrote sixteen volumes on the subject, all of which were subsequently lost. Once the loss was confirmed he decided to rewrite all sixteen volumes, and began by writing 'Vedic Mathematics', intended as an introductory volume. Poor health and then death prevented him from writing any further volumes. Intriguing historical questions are posed by Tirthaji's reconstruction. Not least is the problem of finding the historical evidence used for the reconstruction. His introduction to 'Vedic Mathematics' tells us practically all we know about how the system was reconstructed. Yet the references he gives do not seem to be available, or else those versions which are available do not include the material he refers to. Thus, until further light is thrown on the matter, perhaps the minds of historians ought to be open to a number of possibilities concerning the status of this reconstruction, ranging from its being a work inspired by the vedic tradition, to its being an accurate account of a system used in vedic times. At times, Shri Bharati Krishna Tirthaji seems to adopt the latter view, and it is as well to respect the views of such an outstanding man, bearing in mind his considerable learning in Sanskrit, in mathematics, and in the vedic tradition (as well as in other areas), and also his undoubted integrity. But his main interest seems to be in what he considers the Vedas should be: an all-round system of knowledge. Exposure to this approach eventually shows us that we are dealing with a new way of thinking. One can learn to speak a little French, but think in English. To really enter the spirit of a language one needs to think in terms of that language. Similarly, if he wishes to gain most from this system, the western-trained mathematician is cautioned against trying to fit this system into the mental framework he already has, which is what most western training encourages us to do. If the methods are practised with a neutral attitude of mind, allowing the system to speak for itself, then the possibility is opened of entering the spirit of this approach. Otherwise there is a risk of simply acquiring a few techniques, and not really gaining any overall sense of the approach. This caution apart, the fresh insights offered by this plan should be welcome to western mathematicians: there is much to be said for having two strings to one's bow. With the rapid growth of communications, and the spread of science and technology, the differences between East and West are, in some ways, not so great as they were. One such difference which remains, however, concerns modes of address. As well as being an outstanding scholar, Tirthaji was a very saintly man. Unwillingly he found himself thrust into the position of Shankaracharya, one of four spiritual heads of Hindu India. As such he became known in India as 'Shri Jagadguru Bharati Krishna Tirthaji, Shankaracharya of Puri' or 'The Shankaracharya of Puri', or 'Shri Bharati Krishna Tirthaji'. In the West he is known simply as 'Tirthaji'. Different perceptions lie behind these modes of address. The western viewpoint is, perhaps, that to be acknowledged as a member of the human race is honour enough, and that further titles are superfluous. The eastern world, by contrast, still pays considerable respect to a man's office. These are cultural differences, and people of each culture need to respect the existence of a different point of view. May India continue to uphold her ancient and colourful tradition, despite the world-wide tendency towards a drab monoculture! The present work has been put together with more haste than the authors would have liked. It is hoped readers will take more interest in what it has to offer than any defects it may contain. Nevertheless, we would appreciate having our attention drawn to any errors or omissions. This book is intended to commemorate the birth of Shri Bharati Krishna Tirthaji. As such it is perhaps appropriate to conclude with a few remarks about the man and his ideals. He believed in the ancient tradition of all-round spiritual and cultural harmony, and his ambition for humanity was a world-wide cultural and spiritual renewal. An excellent brief account of the man, his life and works, is given by Mrs Manjula Trivedi in her preface to 'Vedic Mathematics'. She looked after him during the last few years of his life, and is now in charge of the foundation he set up in Nagpur in 1953, the 'Shri Vishwapunarniman Sanga' (World Reconstruction Association). It was founded to act as a vehicle for world renewal. 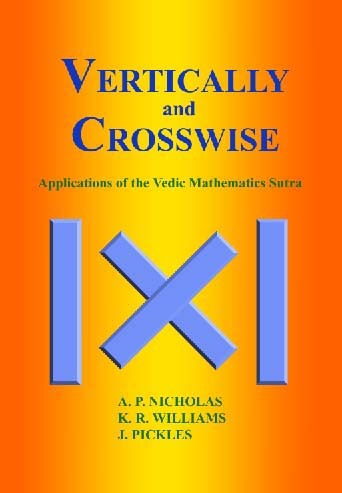 One of the principal formulae (sutras) of Vedic Mathematics is "Vertically and Crosswise". The applications of this simple formula are extraordinarily diverse and wide ranging, the present book probably only touching on its true extent. After a detailed introduction to Vedic Mathematics this book shows applications of Vertically and Crosswise from basic calculations (multiplication, division, reciprocals, squaring, square roots and combined operations) to the evaluation of logarithms, exponentials, trigonometrical functions and the solution of simultaneous, transcendental, polynomial and differential equations. The methods shown are not only exceedingly efficient and new but have a unity and coherence which renders them easy to master and enjoyable to execute.